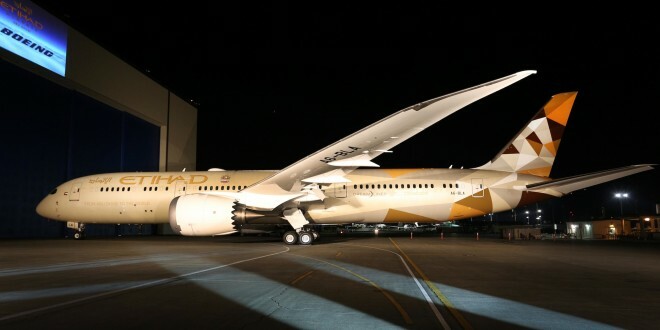 Etihad unveils 'Facets of Abu Dhabi' livery on its first Boeing 787-9 Dreamliner A6-BLA as it rolls out of the paint hangar at Paine Field, Everett, WA. Boeing image. National carrier, Etihad Airways of Abu Dhabi will commence its third daily flights between Abu Dhabi and Mumbai effective February 15, 2015, and New Delhi effective May 1, 2015. The airline will also commence flights to Kolkata starting February 15. All three flights will be operated with a narrow body A320 in a two class configuration. With this, Jet Airways in which Etihad holds 24% stake, and Etihad will increase their weekly flight count between Abu Dhabi and 14 Indian cities to 217. 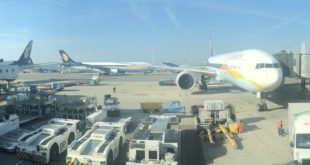 James Hogan, President and Chief Executive Officer of Etihad Airways has indicated the airline has already increased its passengers carried on Etihad’s India routes by 51% to 620,000 during the first half of this year.